WINNER of the least photogenic food ever! Is there anything better than cream of mushroom soup? My mom was a big fan of condensed cream of mushroom soup. Like boxes of cans in the basement before Costco existed, even though everything else she made was made from scratch. Look up “canned cream of mushroom soup with chicken recipes” online. That’s just one taste of my childhood. 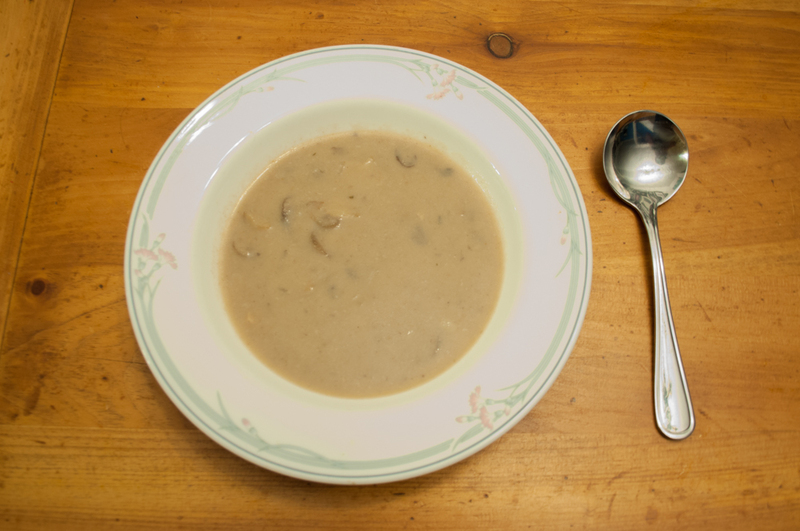 Seeing as it’s mid-April and winter still doesn’t want to leave us here in Toronto, I find myself craving cream of mushroom soup. But they don’t sell ready-made dairy-free cream of mushroom soup at my usual grocery store. I’m not entirely sure they sell it anywhere. Which means that I’m going to spend the better part of an hour making it. I don’t really truly remember what canned chicken soup tastes like exactly, but I know that this version has a stronger mushroom flavour and doesn’t have that particular sweetness that real dairy tends to have when cooked. But frankly, that sweetness isn’t worth a two-day tummy ache, so here we are. Turn on the toaster oven to bake mode and set at 400ºF. Cut the top off the garlic head, drizzle some olive oil over it and wrap up in foil. Throw that in the toaster oven until your kitchen starts smelling super good. About 20 minutes. In a medium sized soup pot, heat up the oil on medium. Add diced onions and sauté until translucent. About 3 minutes. Throw in the mushrooms and stir until the mushrooms have reduced their size by half and let out a good amount of tasty mushroom juice. This took maybe 10 minutes which I mostly spent playing around on my computer and only stirring the mushrooms every couple of minutes. Use your ears, people. If the frying gets louder, that means you’re losing liquid. Which means things are going to start burning! Take out half the onions and mushrooms and put them in a blender with the coconut milk. My coconut milk was separated, so the water went into the blender and the cream/fat went into the pot. Squeeze out the roasted garlic from the skin (careful! It’s hot!) and add to the blender. Liquify it all! Add this back to the pot along with half the chicken stock and thyme. Keep this at a low simmer with the lid on. Now to make a roux to thicken the soup up and add some extra rich, fatty flavour. Heat up the butter and flour on medium in a separate small pot. Keep stirring and moving it around so it doesn’t burn, breaking it up as it turns into a big ball. Once the mixture turns golden and starts to smell a little toasty, slowly pour in the stock while stirring quickly to break up any clumps. Add this mixture to the soup and bring to a boil for at least a couple of minutes. Add salt to taste.